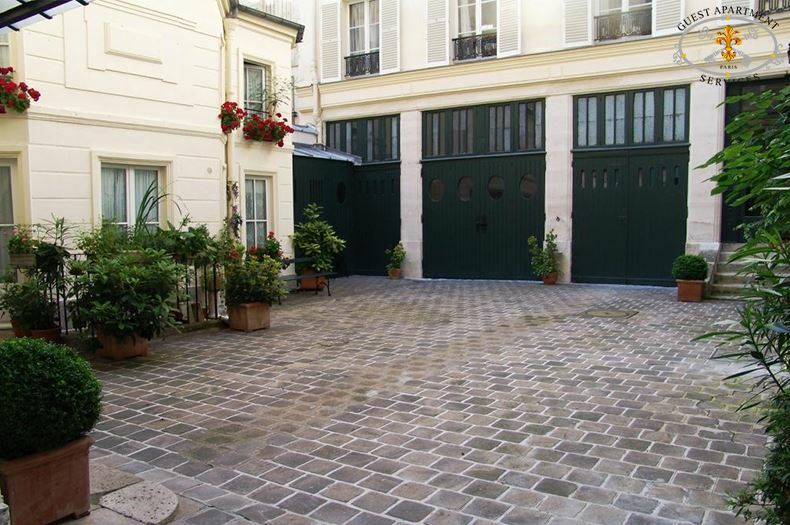 A romantic and quiet property , opened to a private building paved flourished courtyard. A complete privacy. 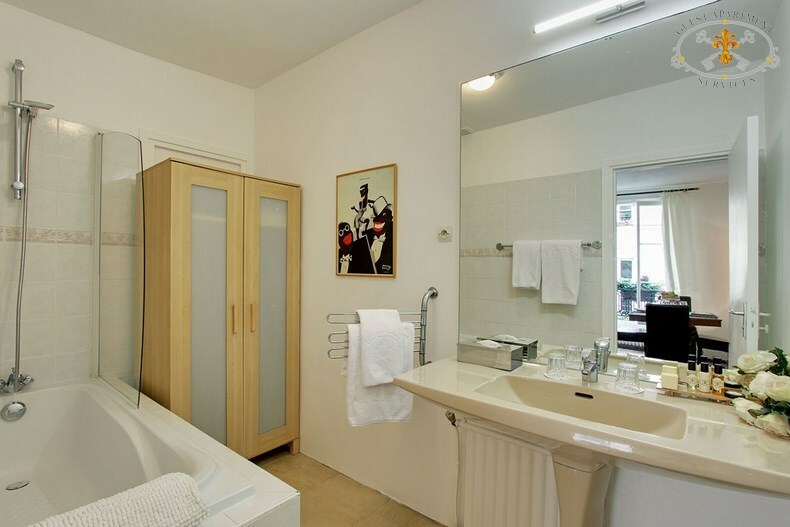 Titled bathroom with a bath tub and shower fixture, a washbasin with a large mirror. A large and quiet paved courtyard adorned with plants. 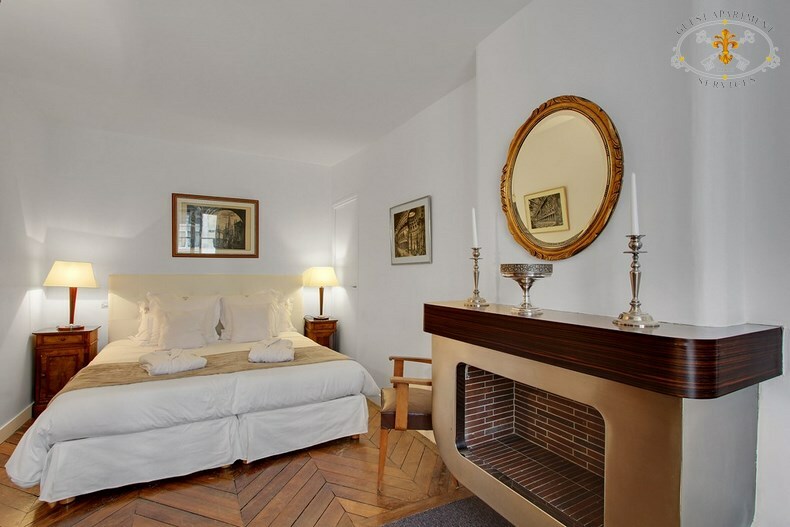 Situated on Ile Saint Louis. 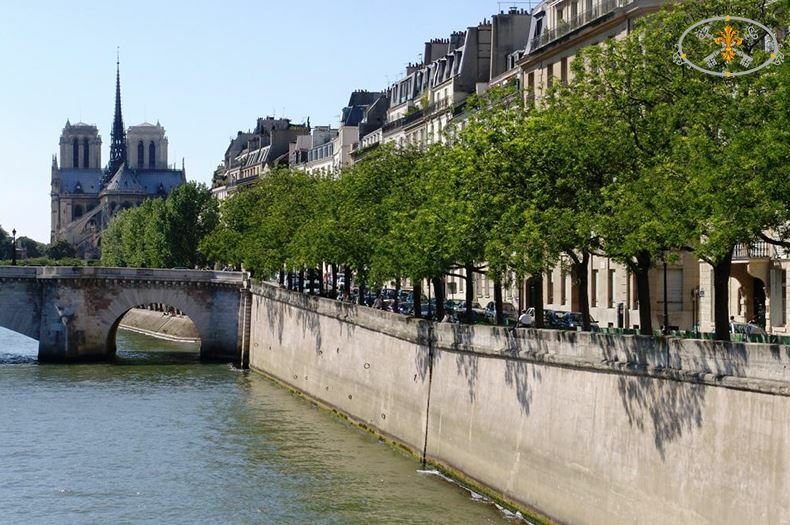 You will enjoy being at the middle of historic Paris, but without all the noise and traffic of cars or people. 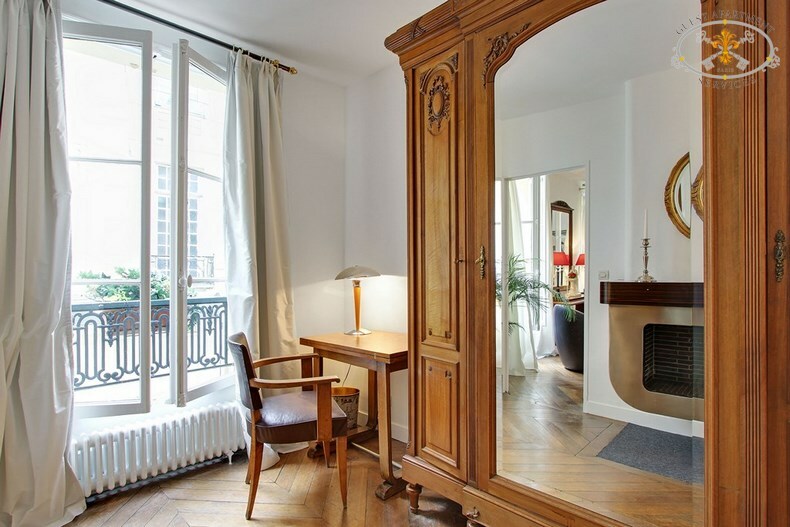 This Paris vacation rental apartment is a quiet haven. 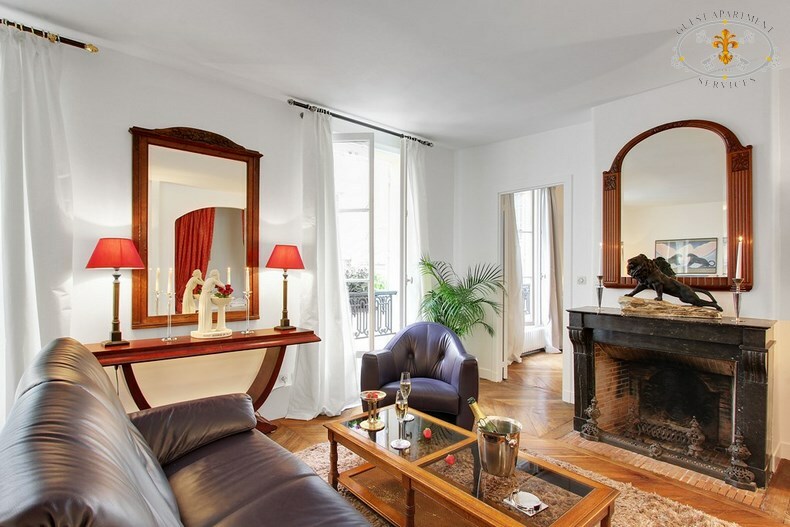 You will find on the Island all the convenient shops and boutiques creating a real village spirit with authentic bakery, grocery, butcher, post office, restaurants… In this apartment you are within walking distance to Notre Dame Cathedral. 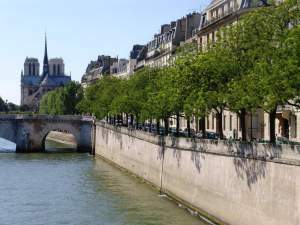 You will be very close to all sorts of entertainment and curiosities : the Louvre, the Pompidou centre, the Left Bank and Latin Quarter, the Saint Chapelle. For those who love to explore on foot, this location represents a rare opportunity. The little village of the Ile Saint Louis will enchant you with its very warm and friendly atmosphere. 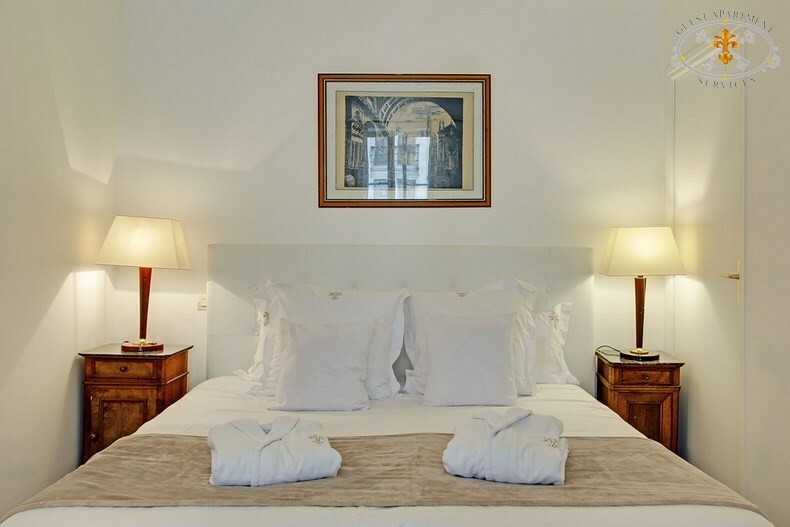 Located in a 17th century elegant building on avery quiet courtyard which has just been totally renovated only one year ago. 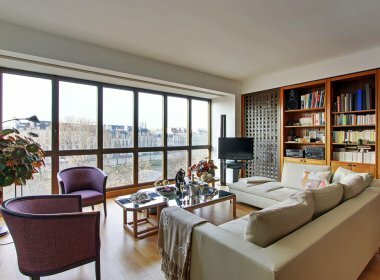 Entering inside the building, passing a large green courtyard, a flight of stairs will lead you to your Parisian “Pied à terre” in the first floor. Upon entering you will find the lavatories to your left and the kitchen in front of you. 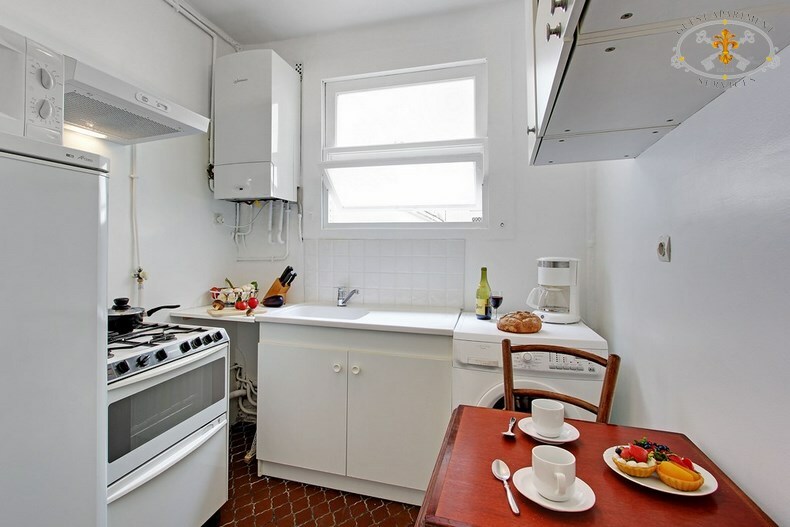 The appliances of the kitchen consist of a stove/oven/dishwasher unit, a fridge and freezer section, a washer/dryer unit, coffee maker and a large sink with an adjacent food preparation work space. All utensils, dishes, cutlery and glassware for preparing and serving lunch or dinner are present. A small table and two bistro chairs invite for intimate breakfast. 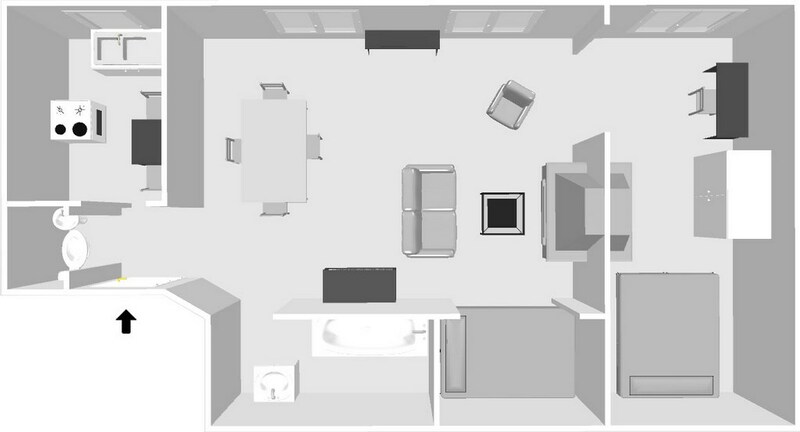 Adjoined to the kitchen appear the real space of living: the dining and living room areas. Two large windows draped in white taffeta fill the room with light. 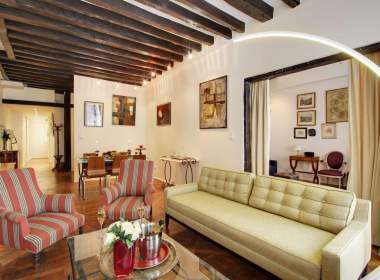 The dining area consists of a square antique table accompanied by four modern chairs. An impressive Art Deco buffet with a black marble top is surmounted by a gilt mirror and two antique sconces, it shelters a table service. The living area is oriented toward the working fireplace located opposite the dining area. The mantel is adorned with an elegant Art Deco mirror. There is an armchair, a comfortable leather couch and a wooden and glass coffee table. 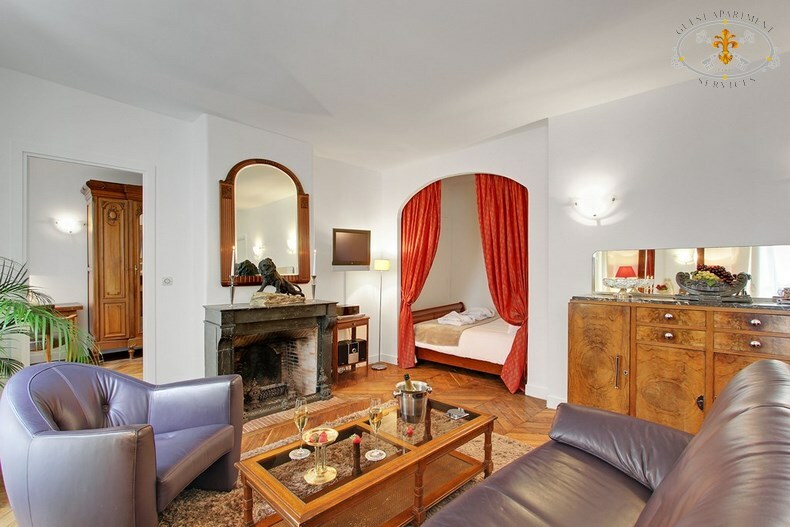 On the right side of the living room is a deep niche with an antique double bed for an extra guest. The niche has been curtained with red taffeta to provide complete privacy. 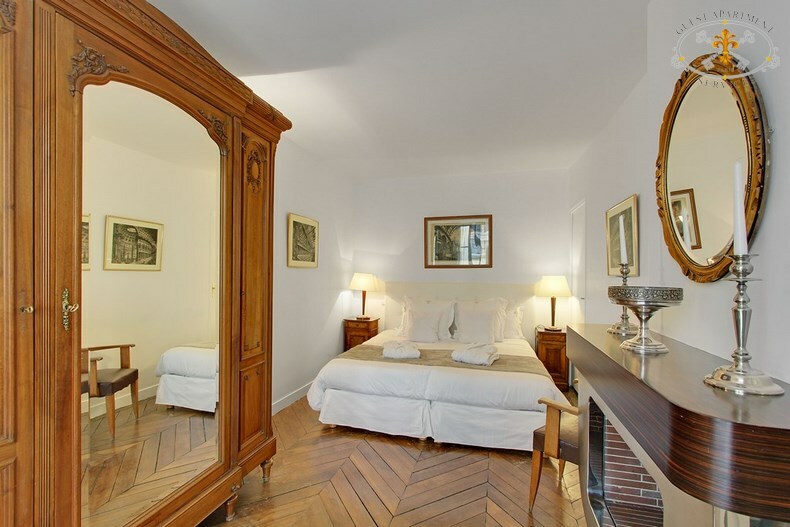 The bedroom is a deep room with one tall window also overlooking the courtyard. 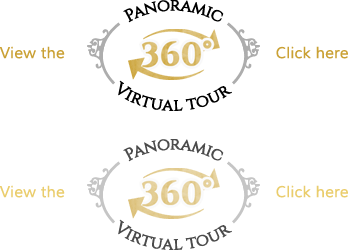 There is a huge 19th century wardrobe closet. Next, one can sit at the small secretary desk to write postcards. 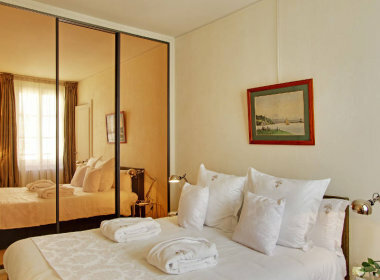 A King size bed convertible in twin beds fills the back half of the room. Both side of the bed, bedside table and reading lamps are present. The bathroom has a full bathtub, with shower attachment. Here you will find a washbasin with a large lit mirror and cabinets for organizing your toiletries. Hairdryer is available. Iron and iron board are also available. Other main electrical appliances for your convenience: Cable TV (with the main international channels), private telephone line with answering machine. 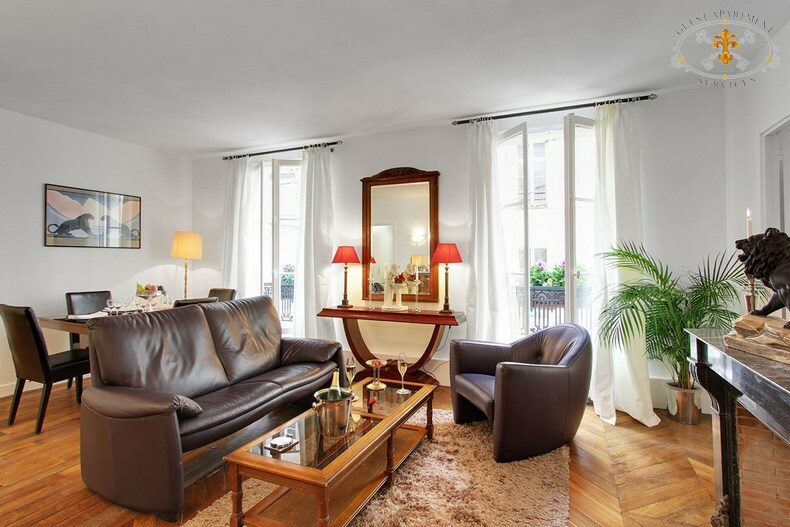 New WIFI High Speed internet with the same unlimited free connection as in all our Paris apartment rentals.In addition there is intercom device for your own security and privacy. This is a non-smoking apartment. For sanitary reason, pets are not allowed. The building is absolutely secure. There is a very nice custodian in the building that has lived there for over 20 years. NOTE: FOR EXTENDED FAMILIES OR PARTIES, TULIP PROPERTY ( 1 BEDROOM) & ORCHID PROPERTY – (3 BEDROOM) OFFER AN EXCELLENT COMBINATION. 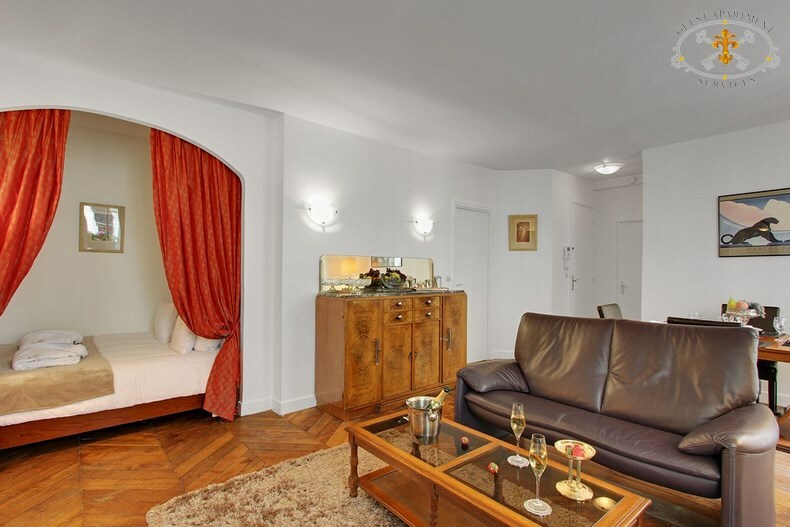 BOTH PROPERTIES ARE LOCATED IN THE SAME BUILDING, OFFERING SPACE & PRIVACY FOR EACH MEMBER. THIS COMBIANTION CAN SLEEP UP TO 9 PERSON. Brilliant. 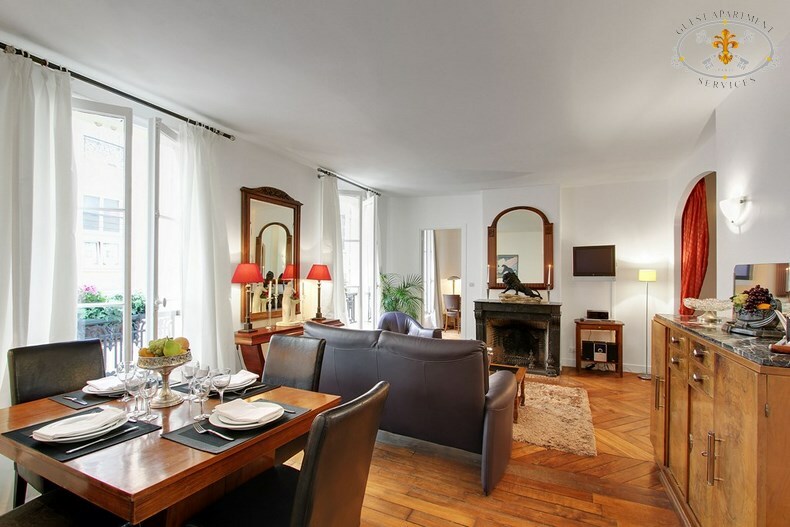 We stayed in 'Tulip' on Ile Saint Louis. The Apartment was lovely, quiet and convenient. More importantly, the GAS staff made the entire process stress-free. Highly recommend.